American soprano who captivates audiences with her sumptuous voice, consummate artistry, and compelling stage presence. 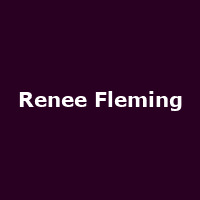 A four-time Grammy winner, Ms. Fleming won the 2013 Best Classical Vocal Solo Grammy Award for Poèmes (Decca, 2012), a collection of 20th-Century French music, including works composed especially for her by Henri Dutilleux. Over the years, she has released a number of music recordings on the Decca label, her latest album 'Guilty Pleasures' was released in 2013.